Hernan Cortes was born into a family of "little wealth but much honor" in Castile, Spain in 1485. At the age of fourteen he attended the University of Salamanca but he left after just two years. In 1504 he sailed for Hispaniola (now called Santo Domingo) where he settled for six years, becoming a farmer and a notary to the town council. In 1509 he missed two ill-fated expeditions to South America due to contracting syphilis but in 1511 was sufficiently recovered to accompany Diego Velazquez on his conquest of Cuba. Velazquez was appointed Governor of Cuba and Cortes became a clerk to the Treasurer, eventually rising to be elected mayor (alcalde) of Santiago twice. In 1518 Velazquez designated Cortes Captain General of a new expedition. Cortes took eleven ships, 608 men, and sixteen horses with him to Mexico. He landed at Tabasco in March 1519, quickly winning over the local population. He stayed here for some time, gathering intelligence and founding Vera Cruz. A local woman, Marina (also known in Mexico as Malinche), became his interpreter and later bore him a son, Martin. He also burned his ships, committing himself and his forces to their mission of conquering Mexico, there was no turning back. Cortes quickly discovered that the Aztec empire was hated and feared by many of the other Indian tribes who had to pay tributes (including people to be sacrificed) to the Aztecs. By keeping conflict to a minimum, Cortez made over 200,000 allies, including the Tlaxcala, who became his closest allies after being defeated by the Spaniards. Cortes finally reached Tenochtitlan, capital of the Aztec empire on 8th November 1519 where Emperor Moctezuma II received him with great honour, believing him to be the reincarnation of the Aztec god Quetzalcoatl. Cortes soon took Moctezuma captive. At this time a Spanish army, led by Panfilo Narvaez, landed on the Mexican coast, with orders from Velazquez to capture and arrest Cortes. 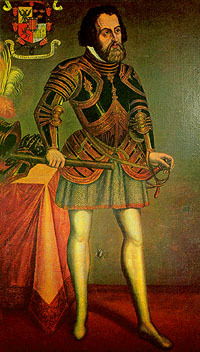 Leaving Captain Pedro de Alvarado in charge at Tenochtitlan, Cortes engaged Narvaez, defeating him and enlisting many of Narvaez's soldiers to his side. On returning to Tenochtitlan however he found that the Aztecs had revolted after Alvarado had massacred several of their chiefs. The Spaniards had to retreat. Cortes overcame a huge Aztec army at Otumba on July 7th 1520 and reached Tlaxcala where he rebuilt and reorganised his forces. They marched again on Tenochtitlan, laying siege to the city. It finally fell on 13th August 1521 - and with it the Aztec Empire. Cortes razed Tenochtitlan, and built Mexico City in its place. 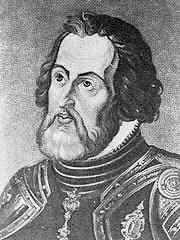 In 1522 Cortes was appointed Governor and Captain General of New Spain. 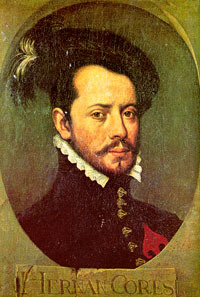 Velazquez, jealous of Cortes' success, embarked on a smear campaign back in Spain, which Cortes tried to refute by sending a series of long letters to King Charles V. In 1524 Cortes went on a disastrous expedition to Honduras, damaging his health and reputation. The officials he left in charge confiscated his property in Mexico. Their administration was cruel, and this caused consternation in Spain. Luis Ponce de Leon was sent to Mexico to discover what was happening but he died almost immediately. Cortes was accused in some quarters of poisoning him. In 1528 Cortes returned to Spain, with gifts of treasure, to plead his case with the king. Charles V received him and made him Marques del Valle. He returned to Mexico in 1530 and spent the next ten years there. In 1540 a viceroy was appointed and Cortes returned to Spain. He accompanied Charles V on a final expedition to Algiers, which ended in failure. He died in Seville on 2nd December 1547, and his remains were transported to Mexico City in 1629.